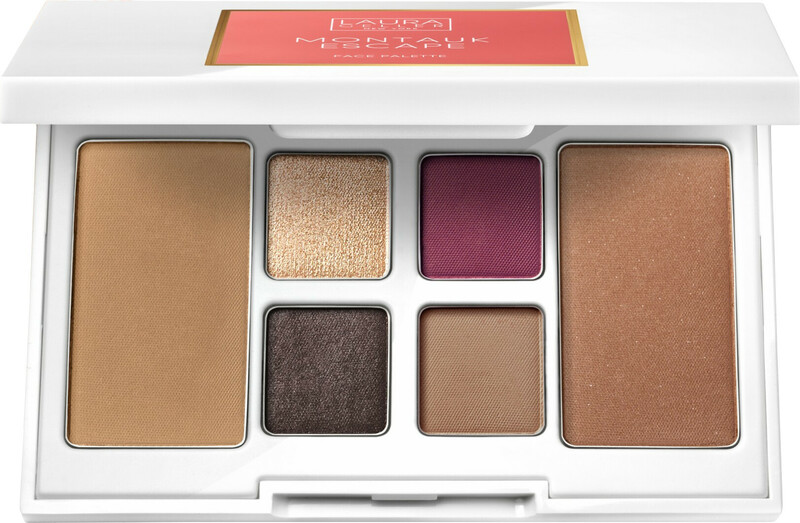 Escape to a golden sunset with the Laura Geller Montauk Escape Face Palette. A harmony of romantic, sunset-inspired hues, the Montauk Escape Face Palette is a one-way ticket to an exotic destination. A summer must-have, this travel-friendly palette will finish the eyes in fiery plums and mesmerising bronzes while embellishing skin with a sun-kissed glow like no other. Laura Geller Eyeshadows 4 x 0.8g Cabana, Popsicle, Sandcastle & Bonfire: With the intense gold, rich berry, plum-brown and matte clay shades included in the Montauk Escape Face Palette, the possibility for sunset-inspired looks are infinite. Laura Geller Blush 5g Summer Solstice: This brown terracotta shade is woven with bronze shimmer that will give the cheeks an eye-catching glow. Laura Geller Bronzer 6.2g Vitamin Sea: This warm bronze hue will give the complexion definition and a healthy glow. Laura Geller Bronzer (Vitamin Sea): TALC, DIMETHICONE, DIMETHICONOL STEARATE, DIISOSTEARYL MALATE, CAPRYLYL GLYCOL, HEXYLENE GLYCOL, PHENOXYETHANOL, CI 77491/77492/77499 (IRON OXIDES), CI 77891 (TITANIUM DIOXIDE). Laura Geller Blush (Summer Solstice): TALC, MICA, CAPRYLIC/CAPRIC TRIGLYCERIDE, CALCIUM SODIUM BOROSILICATE, DIMETHICONOL STEARATE, MAGNESIUM MYRISTATE, DIMETHICONE, TRIMETHYLSILOXYSILICATE, CAPRYLYL GLYCOL, HEXYLENE GLYCOL, PHENOXYETHANOL, TIN OXIDE, ALUMINUM HYDROXIDE. MAY CONTAIN +/-: CI 77891 (TITANIUM DIOXIDE), CI 77491/77492/77499 (IRON OXIDES), CI 15850 (CI RED 7 LAKE), CI 19140 (YELLOW 5 LAKE), CI 42090 (BLUE 1 LAKE). Laura Geller Eyeshadow (Bonfire): TALC, MICA, SYNTHETIC FLUORPHLOGOPITE, DIMETHICONE, OCTYLDODECYL STEAROYL STEARATE, ZINC STEARATE, POLYBUTENE, CAPRYLYL GLYCOL, HEXYLENE GLYCOL, GLYCERYL STEARATE, TOCOPHEROL, LECITHIN, ASCORBYL PALMITATE, GLYCERYL OLEATE, PHENOXYETHANOL, CITRIC ACID, CI 77891 (TITANIUM DIOXIDE), CI 77491/77492/77499 (IRON OXIDES). Laura Geller Eyeshadow (Cabana): MICA, OCTYLDODECYL STEAROYL STEARATE, TALC, PENTAERYTHRITYL TETRAISOSTEARATE, CAPRYLYL GLYCOL, HEXYLENE GLYCOL, MAGNESIUM MYRISTATE, PHENOXYETHANOL, TIN OXIDE. MAY CONTAIN +/-: CI 77891 (TITANIUM DIOXIDE), CI 77491/77492/77499 (IRON OXIDES), CI 77510 (FERRIC FERROCYANIDE). Laura Geller Eyeshadow (Sandcastle): TALC, MICA, DIMETHICONOL STEARATE, DIMETHICONE, DIISOSTEARYL MALATE, OCTYLDODECYL STEAROYL STEARATE, CAPRYLYL GLYCOL, LAUROYL LYSINE, PHENOXYETHANOL, ZINC STEARATE, HEXYLENE GLYCOL, ALUMINUM HYDROXIDE, CI 75470 (CARMINE), CI 77491/77492/77499 (IRON OXIDES), CI 19140 (YELLOW 5 LAKE). Laura Geller Eyeshadow (Popsicle): TALC, MICA, DIMETHICONOL STEARATE, DIMETHICONE, ALUMINUM HYDROXIDE, DIISOSTEARYL MALATE, OCTYLDODECYL STEAROYL STEARATE, CAPRYLYL GLYCOL, LAUROYL LYSINE, PHENOXYETHANOL, ZINC STEARATE, HEXYLENE GLYCOL, CI 75470 (CARMINE), CI 77491/77492/77499 (IRON OXIDES), CI 42090 (BLUE 1 LAE).